Its earthy, sophisticated dishes are French cooking at its best. Charred brussels sprouts (greek yogurt, rye crumb, herbs); littleneck clams (bacon, potato, white wine, cream, herbs, crostini); seasonal salad (mixed greens, fruits, vegetables, grains, seeds, Champagne vinaigrette). Photography by Angel Tucker. 8 Anoka Ave., Barrington, 337-5830, tableri.com. 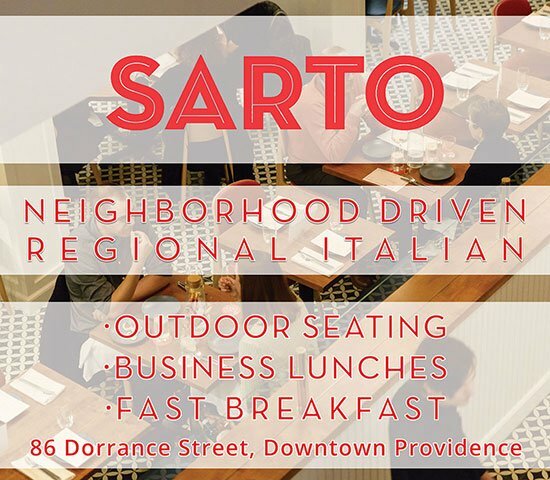 Open Tues.–Sat. for lunch and dinner. Reservations recommended. Wheelchair accessible. Lot parking. Vibe The most inviting corner of a French farmhouse. Prices Appetizers: $7–$18; entrees: $18–$30; dessert: $8. Karen’s picks Pork belly, house burger, seafood and a back-up order of frites. And if any genre of cooking is able to manifest the poetic — that is, the transformation of the ordinary into the romantic -— it is in the French bistro. Intent on pushing past the formality of classic French fare, a bistro is concerned with the Earth’s harvest: grapes, agriculture and the animals that it sustains. 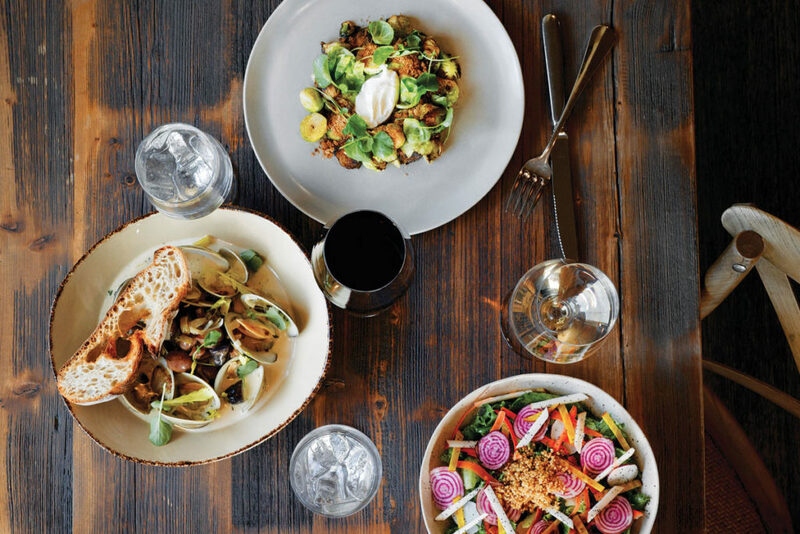 No surprise that the country’s most beloved restaurants are not only in the cities but also perched out in the country where the inventory is carried in, still warm from the ground. It’s the original farm to table model, without pretense or ostentation. What is surprising, however, is that owners Claude Lochet, Susan Schraer and Logan Tharp create the same experience in suburban Barrington. Roasted chicken breast with farro rutabaga hash, fried soft egg, spinach ricotta. Photography by Angel Tucker. A few turns off of the main street, Table Bistro is a world all its own. Paneled in worn wood with accents of white marble, cast iron and brocade, the thirty-three-seat restaurant reads much smaller — a sign not of confinement but of intimacy. It feels as much like a European farmhouse as possible or a small corner of one on the very edge of society. Manager Lochet puts together the wine list and everything else, including conversation, emanates from it. Like any authentic French restaurant, the regions, varietals and crafting of wine are not simply respected, they’re worshipped. Every time a bottle is uncorked, a story is released through scent, spice and a history that Lochet shares tableside, so that every sip brings diners a moment closer to the native terrain. Pork belly is delivered in much the same manner. The fatty cut of meat has become so ubiquitous these days that it’s easy to find it unappealing in the wrong hands. But Tharp is meticulous in his approach, slicing sections that are as meaty as they are unctuous. Braising the pork in its own fat before roasting makes both components more pronounced -— a smoky char sinking into viscousness. Paired with a cold side of mustard greens, carrot puree and pine oil made from neighboring trees, it’s a compelling look at how France can make its mark on southern American food. 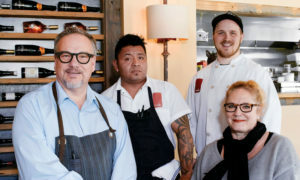 From left: Claude Lochet, server/owner; Jorge Perez, sous chef; Logan Tharp, executive chef/owner; Susan Schraer, server/owner. Photography by Angel Tucker. All of this comes out of a semi-open kitchen that functions much like a hearth. There’s an earthiness to so many of Tharp’s dishes — baked gnocchi covered in gruyere, wild mushroom risotto, charred brussels sprouts with rye crumbs — but it’s balanced by a carefully constructed artistry. To be a bistro, one pays homage to the land; to be French is to make the land’s bounty more beautiful. Tharp is committed to both. Roasted chicken breast is the prodigal son of poultry but Tharp serves it alongside a molded rillette of dark meat. Aggressively salted, it pairs the high and the humble, both equally appealing when given the proper attention. And if the kitchen gravitates toward unassuming ingredients, the approach seems more like a dare to elevate that which defines modesty. Whole scup is initially met with disbelief (“we used to throw that back,” says the resident fisherman) but, served boneless and under a rainbow of roasted vegetables, the fish becomes a simple celebration of seasonal fare. 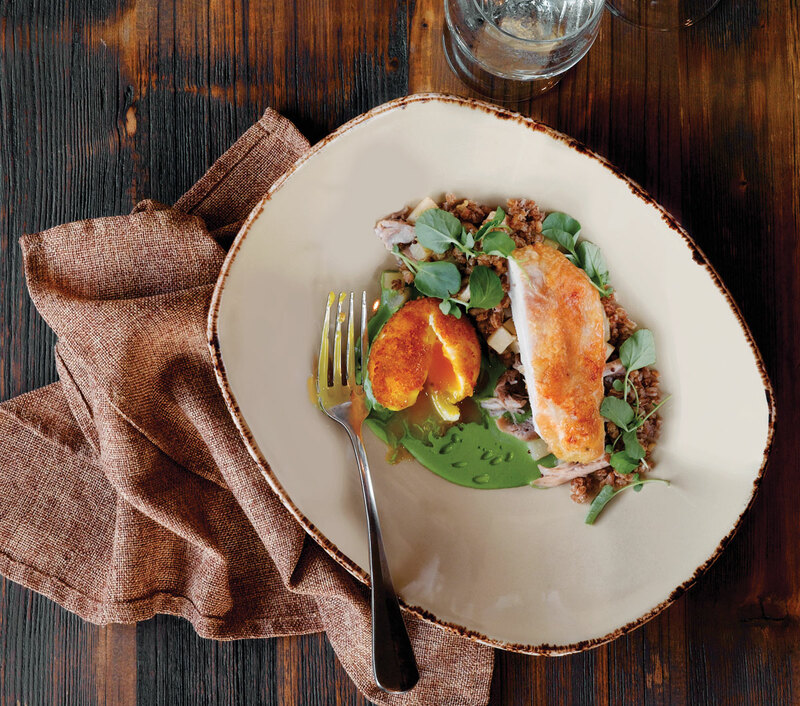 A refined quail ($25), swaddling sage stuffing and on top of a smooth sweet potato puree, is the delicate hinge between the colloquial and the coiffed: a dish that rewards our love of the familiar in a modern incarnation. All the while, Lochet circles the room with a Nantucket red pitcher and a tale to tell. As the wine list changes, so too do the chapters: The young Beaujolais gives way to the gamay and, in time, everything will shift to the dense, woody fruits of cabernets. It is in this rarified space — warm, communal and uniquely enchanting — that you feel you’ve not only escaped the world, but that you’ve come home for a few brief hours. There are always more bottles of wine to extend the stay — though dessert, designed as a remembrance of things past, also helps to stretch out the hours. Dave’s Coffee coffee milk bread pudding is as good as it is straightforward, while chocolate peanut butter mousse served on cubes of cornbread is as concerned with panache as it is with sweetness. But the unassuming chocolate mousse with slabs of free form cookies is the bistro in a bite: wholly memorable for what it evokes as much as for what it promises. There is always anticipation in facing what we do not know, what surprises and transforms us, but, as Lee points out in his ode to peaches, the most poetic interactions of our day often arise in the way we come to see what is familiar. Chicken, potatoes and wine may be the mainstays of a meal, but given the proper due, they prove to be the cornerstones of a rustic revelation, one in which a single plot of soil might expand the potential of a chef and the scope of a diner. Poetry, in that sense, isn’t necessarily something we express through language but something we bring to the table and share.